Andrew Baldwin is an established glass artist whose work is carefully crafted and rich in meaning, with the practice of meditation and retreat a continued inspiration. Andrew thinks of his work as “being meditations on detail: the spine of a feather, ripples on water, light on the edge of the leaf. These impressions are interpreted into glass with a particular attention to the process of mark making and the impact of the different qualities of the glass surface.” His most recent work is a continuation on the theme of the ‘void’ which was conceived while staying on a remote farm in the Mallee district of South Australia and explore the experience of space and isolation. In Andrew’s words, “What at first appears dark and ominous revealed a sense of lightness and potentiality.” Through his glass practice, Andrew is exploring this notion of space, both physically and mentally, and how it has the ability to change the way in which we view the world. 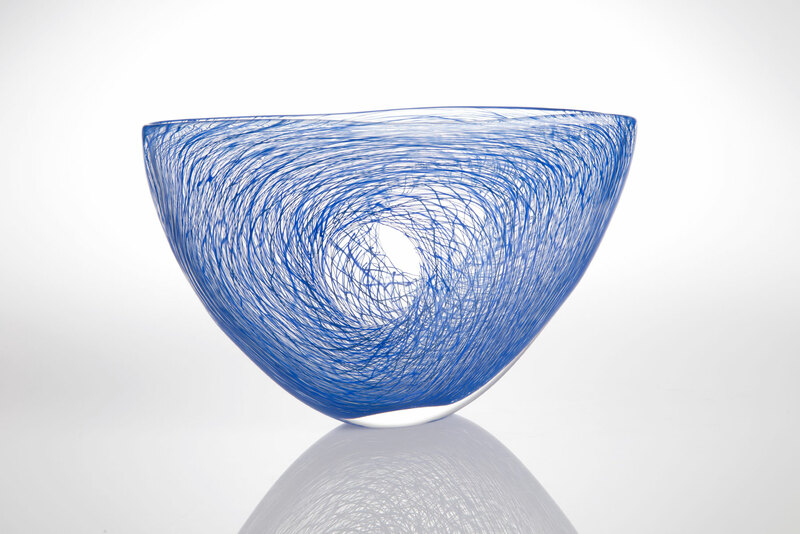 The process that he uses is based on traditional Venetian glass blowing techniques, creating an intricate skein of threads of colour enveloping the glass. Andrew Baldwin graduated with Honours from the Glass Workshop at the School of Art, Australian National University in 2000. Since graduating, he has had a number of solo exhibitions, both within Australia and internationally. Andrew has also been the recipient of the Australia Council for the Arts, New Works Commission in 2007. His work is held in the collections of the National Gallery of Australia, National Glass Collection at the Wagga Wagga Art Gallery and the Toyama City Glass Collection (Japan).